Frank Gore left the 49ers for the Colts, linebackers Patrick Willis and Chris Borland retired, and another linebacker tore his ACL while working out. New head coach and incredibly quotable man Jim Tomsula is having a rough first offseason so far. In unrelated news, he compared San Francisco's .500 season to a sandwich while talking about quarterback Colin Kaepernick. "When we go back to the criticisms on Colin — look we were 8-8 last year. Everyone takes a big bite out of that sandwich," Tomsula said in comments that can be seen tonight at 7 ET on NFL Total Access. "Colin touches the ball every play. He's the guy when we win, he gets a little bit more than he probably should, and when we don't win, he gets more than he should." Oh, no, no. And again, up until Monday, the only evaluation I have is on defensive lineman, front seven, defensive play, OK? And Im a guy that through the course of my coaching career, Ive held different positions, and I keep my spoon in my soup. I dont taste your soup. I go in and do my job, and do what Im asked to do, and I try to do it to the best of my abilities. 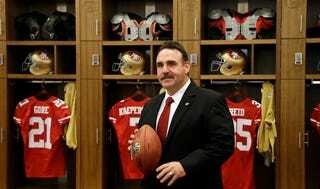 The use of a sandwich to describe the 49ers' unspectacular 2014 season leads us to believe that Jim Tomsula has a problem finding time to eat lunch. If you run into Jim Tomsula, please feed him before he explains how the draft is like a salad.